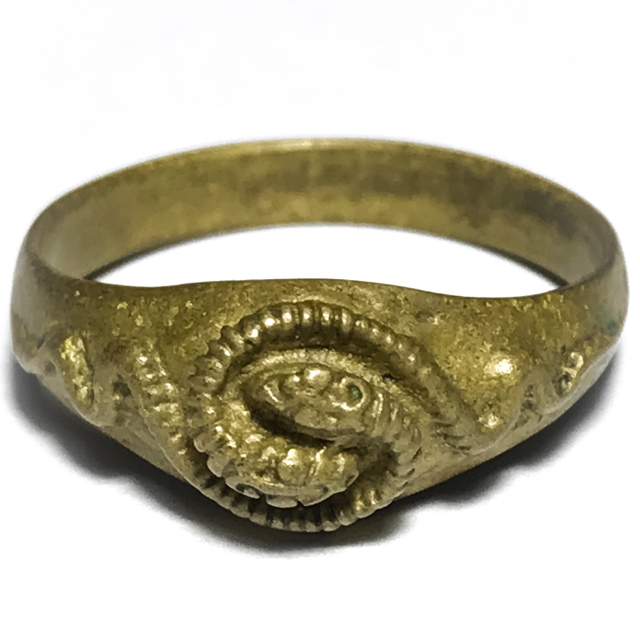 Hwaen Ngu Giaw Sap Magic Snakes Ring of Wealth, treasure and Protection, from Luang Por Im, of Wat Hua Khao. Luang Por Im was an olden days Guru Master, born over 150 Years ago, in 2406 BE, and who passed away more than 70 years ago in 2480 BE.This ring measures 2 Cm Inner Diameter. The ring is estimated to have been made sometime between 2460 and 2470 BE. The Hwaen Ngu Giaw Sap is very old and rare, and is famous for its protective power against snake bites, and its powerful Maha Pokasap magic to attract and retain wealth and treasures. This exhibit is in extremely well kept condition and is a pristine exhibit. The temple orphans ran to the Kuti of Luang Por Im, and told him about this strange sight. Luang Por Im then told them that the herders were from Surin, and had powerful sorcery, and had conjured up an illusion to hide the fact that they were usiing one of the wooden pillars of the Sala building to buirn and cook their rice. he then asked the temple orphans to go and bring him a coconut shell. He took the shell, and used it to sweep the floor of his Kuti with, and then told the orphans to go and check back at the Sala, to see what had happened. Luang Por Im once had a Looksit (Devotee), who liked to play in Siamese Fighting Fish Competitions, but who had never won a single competition. He complained about this to Luang Por Im, who told the devotee to go and bring him some Bai Jag Papyrus leaves. The devotee came back with some papyrus leaves for Luang Por Im, who took them, and folded them into the form of a Siamese Fighting Fish.